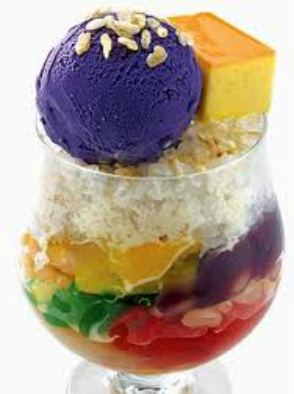 we are known to be the very first caterers in California to provide and serve halo halo on site at private events! This special treat originates from philippine islands and is oh so delicious! it contains an array of tropical items and honestly creates "a party in your mouth". our halo halo is prepared with shave ice at the base, ube ice cream, leche flan, langka (jack fruit), macapuno (coconut), banana plantain, sweet red beans, coconut jelly, pinipig (rice krispies), and sweet cream/evap milk smothered on top.